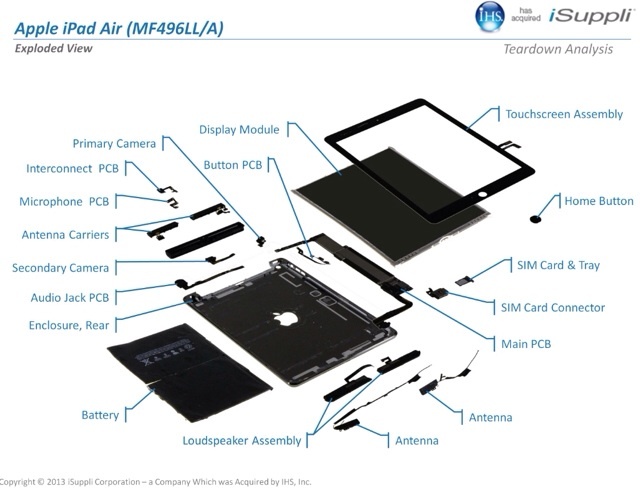 IHS has performed its teardown analysis of the iPad Air and found that it costs less to make that previous iPads, according to AllThingsD. The firm said that the iPad Air costs between $274 and $361 to build depending on the model. Apple sells the device for $499 to $929. The screen which is thinner and has fewer layers cost $133 ($90 for display and $43 for touchscreen components) which is higher than before. A new cycle-olefin polymer (COP) sensor sits underneath the outer layer of Gorilla Glass. It only requires one layer of glass making the assembly 1.8 mm thick compared to 2.23 mm for the previous assembly. The iPad Air only requires 36 LEDs for backlighting compared to 84. Thin layers of optical film are used to distribute the light across the entire display cutting down on the weight and the power drain to the battery. The total component cost for the base iPad Air is $274 which is $42 cheaper than the base iPad 3. Notably, the A7 chip costs $5 less than the A5 processor cost 18 months ago. IHS estimates that Apple's gross margins on the iPad Air range from 45% on the 16GB Wi-Fi model to 61% on the 128GB LTE model.